The iPhone battery lasts a while, and according to Apple it should offer around 8 hours of talk time, 8 hours of internet use over LTE / 3G, 10 hours of internet use over wi-fi, 10 hours of video playback, and 40 hours of audio playback. Additionally, the standby time, that is the time where it’s not in use but it retains a charge, is said to last up to 225 hours (almost a week and a half!). But various iOS updates are often reported to either better or worsen battery life, and it’s a seemingly never-ending stream of opinions every time an iOS version is released whether or not it’s helping or reducing the longevity of the iPhones battery. Rather than just having a loose idea or opinion based on perception, have you ever wondered how long your iPhone battery is really lasting? 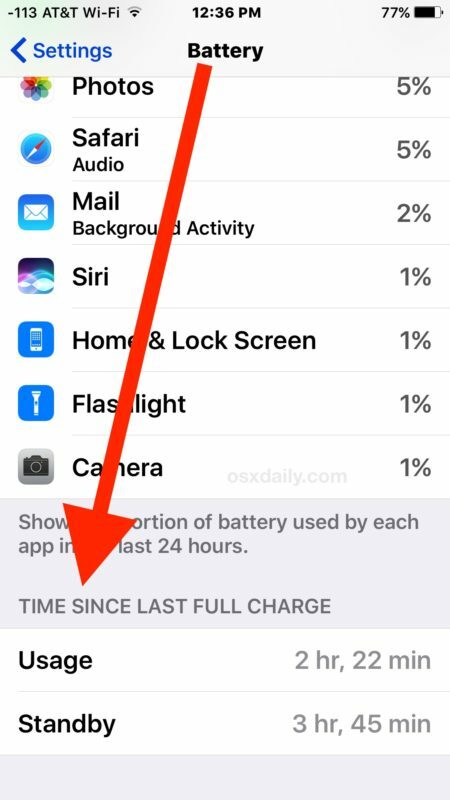 Well you don’t have to wonder, because you can get battery usage data right on the iPhone itself. You’ll probably want the battery percentage indicator on to get the most use out of this, if you don’t have it enabled you can flip it on in the Settings along the way. For best results and to have the most accuracy regarding the total iPhone battery life, wait until your iPhone is somewhere between 1% and 5% remaining battery to check the settings before drawing any conclusions. Similarly, I find it helpful to turn on showing iPhone battery percentage indicator as well. Now that you know exactly how long the battery is lasting since it was last charged, you can help determine if what you see is normal or not. The easiest way to know if the battery usage is normal is to compare what you see relative to your battery percentage remaining, to what Apple specifies as within their range. This is going to vary widely per device and per how you use it, but in most cases about 7-9 hours of usage a day is normal. There are extremes though, and if you’re at 2% battery with 22 hours of usage, you’re in unusually good shape.Likewise, if you’re at 2% battery with only an hour usage, something isn’t working properly and you’ll probably want to try and fix it. If you see something like the image below, with two dashes through the battery usage indicators, it usually just means not enough data has been gathered. Either the iPhone needs to charge to 100% again so it can accurately gather data, or the iPhone has just now been disconnected and so there is simply nothing to report back. Is the Battery Draining Faster, Or Are You Just Using It More? Oftentimes people get a new iPhone or new iOS version and end up playing around with it more, which leads to a perception of reduced battery life, when in fact it’s just that they’re using the device more often. On the other hand, there are cases where an iPhone battery is clearly defective or not functioning properly for one reason or another, and those cases can be easily identified by looking at the real life battery usage data provided in Settings. The Battery Is Definitely Not Lasting Long Enough, Now What? If you’re going to either try a full iOS restore, or if you’re going to take the device into Apple for support, always back it up first, whether that is to iCloud or backing up to the computer with iTunes. Without a backup, you might lose your data and personalization on the iPhone and have to reconfigure everything again. This is really only meaningful data when your iPhone is just about dead. My iPhone 5 gets about 5-6 hours of usage out of it and I have to charge it every night, but I use it often throughout the day. Sitting around on a weekend without usage I can let it rest and only charge it once between Saturday and Sunday though since there’s less usage. Usage makes all the difference, including what apps you use, video, photos, etc. and MAPS is probably the biggest battery hog of them all, if you use turn-by-turn on a road trip you will drain an iPhone 5 down before you reach your destination past a few hundred miles. Its the same on iPad too. Restoring from a backup is a bad idea. You always want to set it up as a new iPhone because if the bad battery life is caused by software, it’s in your backup and will just come right back over when you restore. I agree up to a point. My iPhone4 refused to forget a group of single pdfs. I had renamed them, so the iPhone4 showed two sets of pdfs, where one set would not play, but would not go away when I sync’d w my iMac in iTunes11.0.2. I had to wipe the iPhone4 COMPLETELY as a new iPhone4, to get the original group of pdf’s to go away. But I always try to restore from backup first. It takes several hours to set up a new phone to the last state. • Display brightness – setting the brightness to above 50% has an impact on battery consumption. I’ve found access to the cellular network to be the biggest killer. Heavy access of the web with few bars drains the battery like nobody’s business. On the flip side, an iPhone on airplane mode lasts days and days. 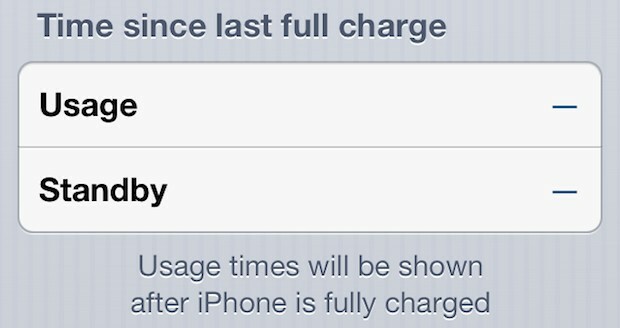 My iPhone 5 will last right around 6 hours of usage, easily 24 plus on standby though. As long as you charge it at work or overnight or in the car you won’t ever have problems with it running out. Uh-oh! 3 days standby??? With or without 3G and WiFi? The problem is the usage stat. Even though I have used it a lot today there is no way I spent 5 hours looking at the screen. Adding all chats together it’s maybe an hour at the most. I think the phone remains in use for a substantial amount of time after the screen is shut off. That’s what kills the battery and that’s the only way I could have racked up 5 hours throughout the day. My iPhone 6’s battery hasn’t been too disappointing.